Today, 85 per cent of children with leukaemia can be cured, but the outlook for patients over 60 is bleak. Only 10 per cent survive beyond one year as their cancer adapts to weather the storm of standard chemotherapy treatments. Associate Professor Steven Lane wants to change that outlook. Steven and his team at the QIMR Berghofer Medical Research Institute have developed a method to rapidly profile the genetics of different leukaemia types—of which there are hundreds—and model them in the lab. 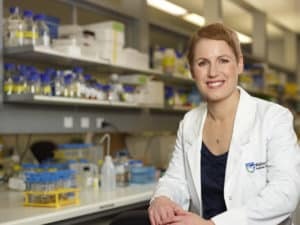 Dr Kylie Mason has set herself the goal of developing new ways of treating diseases that are considered incurable. What began decades ago as the discovery of an antibody from mice that targets human cancer cells is now undergoing human trials in the US as the basis of a treatment for acute leukaemia. The antibody targets a protein called EphA3, which is found in about half of all acute leukaemias as well as many other human cancers including a significant proportion of malignant melanomas, brain tumours and lung cancers. The antibody, called KB004, has been shown to kill certain types of cancerous tumours grown from human samples. Tough electronics is needed to track stem cells. Melbourne company bluechiip has invented tracking chips that survive cryogenic temperatures, high temperature sterilisation and irradiation. Now they’re planning to use the chips to track submissions to cord blood and stem cell banks.